Our Metro Board and Associate Board of the Legal Aid Society (ABLAS) have combined forces! We’re pleased to introduce the Metropolitan & Legal Aid Associate Board, or M-LAB. Read more about M-LAB here. 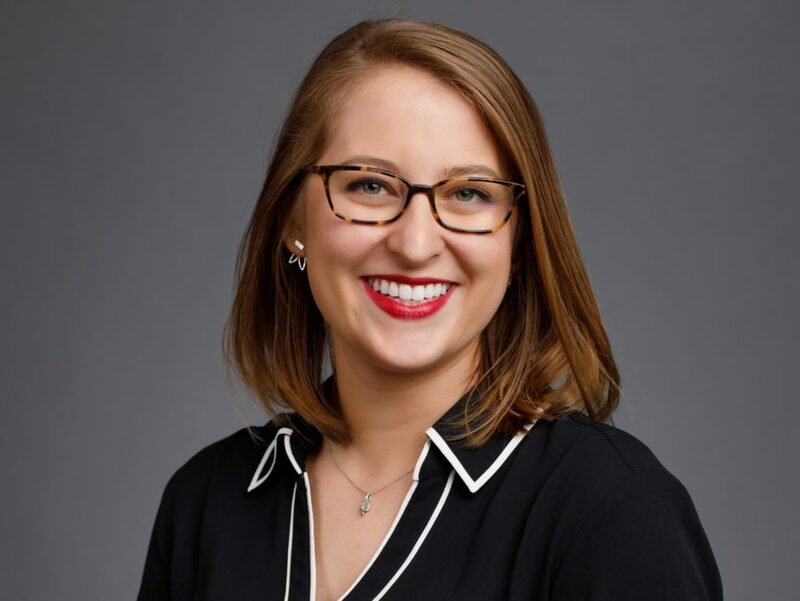 Board member Katy Malek drew on her experience working at West Monroe Partners, a business and technology consulting firm specializing in mergers & acquisitions, to guide the process as these two boards merged into one. Katy’s involvement was key as the board worked to develop a new charter, clarify its goals, and establish its rebranding. Read on to hear from Katy about her involvement with M-LAB and the importance of engaging with her community. West Monroe Partners: Katy Malek photographed at the offices of West Monroe Partners, Chicago, IL. Photo by Andrew Collings. Why did you join the board? What keeps you involved? I joined M-LAB because I was looking to join an associate board that is hyper-local. That is, rather than fighting one “cause,” I was looking for another way to get even further plugged into my community. Metropolitan Family Services does just that, holistically meeting the needs of community members in the Chicagoland area. I stay involved knowing that my small participation helps MFS continue making their amazing impact in Chicago! Can you share a key takeaway or impactful moment from your time on the board? We frequently hear from folks working within various areas of MFS at each of our board meetings. Every single time someone “on the ground” talks about their daily job, the passion shines through. It’s encouraging and energizing to hear from people committed to making the Chicagoland area a better place and to better understand how they hope to do this. Why is it important to engage with the communities around you? I’ve lived in Chicago for four years now and realized how sheltered I’ve been. I’m not personally confronted with the violence in Chicago, and I became convicted that my self-segregation and lack of involvement only hurts those who live in other areas of the city. I don’t want to remain on the sidelines any longer, but wish to be engaged in the community actively making a difference. How do you hope to see M-LAB develop and grow? I hope we get more members! We recently revised our charter and are excited about the new structure we have as an organization. We need more members to jump in with initiative to start our big ideas strong! Empowerment to me means that I am leaning into my purpose and surrounding myself with people who encourage my potential. At the same time, it means treating other people with this same dignity, seeking to be the person that pushes others toward their potential as well.